What do they mean, and why do they matter? One of the first things that comes with a diagnosis of ALS is the determination of which “form” a person has: familial or sporadic. Sometimes it appears obvious. If there’s a known history of the disease “running in the family,” then the person is said to have familial, or inherited, ALS. If the disease seems to have “come out of nowhere,” then it’s sporadic, or noninherited. But in reality it’s far more complicated than that. The terms familial and sporadic are useful in a practical sense for physicians and patients alike. But modern molecular biology is enabling scientists to dig ever deeper into the molecular underpinnings of ALS, and the more they learn, the more the line between familial and sporadic ALS becomes blurred. A diagnosis of sporadic ALS sometimes turns out to be inaccurate. To understand how this can happen, it’s necessary to know that familial ALS stems from a gene mutation that is passed down from parent to child. Usually, the mode of inheritance is dominant, meaning that a person has to receive an ALS-affected gene from only one parent to develop the disease. A recessive pattern of inheritance requires that a person receive a faulty gene from both parents. How can sporadic ALS sometimes turn out to be familial ALS? For some people, a family medical history is unknown at the time of diagnosis but later becomes available. The new information may show that what at first appeared to be sporadic ALS actually is familial. Even when sporadic ALS is caused by a spontaneous genetic mutation, if the mutation is passed down to future generations, then that person’s ALS eventually may become familial. A common misconception about ALS is that only the familial form is genetic. But both familial and sporadic ALS can stem from genetic causes. 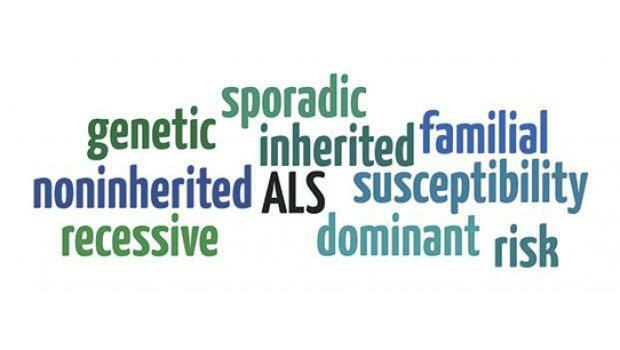 Although the genetic contribution in sporadic ALS is less clear, spontaneous gene mutations, genetic modifiers and genetic susceptibility (risk), alone or in combination, surely play a role in its onset and progression. In addition, it recently was discovered that a mutation in the C9ORF72 gene not only is the most common known cause of familial ALS, but is responsible for a small percentage of sporadic ALS as well — providing yet another clear connection between sporadic ALS and genetic causes. One of the first questions many people ask after receiving an ALS diagnosis — whether familial or sporadic — is whether their children, siblings and parents may have a higher risk of getting the disease. interpret test results and other disease-related information. MDA/ALS centers can refer individuals and families to genetic counselors who are knowledgeable about ALS. Recent advances in our knowledge of the causes of ALS have revealed that some individuals who seem to have the sporadic form of ALS may indeed carry genetic defects known to cause familial ALS. While this impacts a relatively small number of individuals, it’s important to recognize this possibility because of its potential implications for relatives. People with ALS and their families need to understand what’s meant by the labels used to describe the disease, and should seek genetic counseling for help with questions or concerns about inheritance and any associated risks for family members.